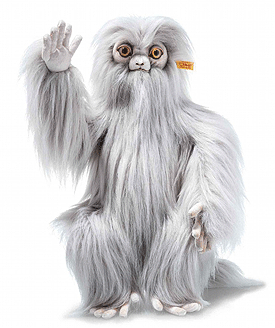 Steiff Demiguise, is one of the characters from the new film, Fantastic Beasts and where to find them. The Demiguise is a primate-like creature that resembles a silver-haired orangutan with large, doleful amber and black eyes. He is made in beautifully fine silver grey, cuddly soft plush and not being jointed has it's advantage of making him extra soft for children. He wears the famous Steiff button in ear, together with the classic yellow ear tag.